Bill Ferguson’s paintings attempt to tell the ancient stories of Australia through a series of meandering dots and landscapes. He asks that the viewer take time to be still and reflect - and to ‘walk’ with him in order to explore mythologies of the Aboriginal Dreamtime. It is his view that, in his paintings, the space gives us the opportunity to open our minds to new possibilities and thoughts. William Ferguson was born in Melbourne, Australia, in 1932, and studied painting at both the Royal Melbourne Institute of Technology and Melbourne Teachers’ College. He lectured in and taught painting, before embarking on a full time career. In 1962 he held his first exhibition at the Argus Gallery in Melbourne and since then has had many successful solo and group exhibitions in all Australian states. The dreamlike quality and misty colours of his work provide the opportunity for the viewer to pause and contemplate them in silence. In doing so, this allows viewers to fill that void which exists in each of us – the gaps between knowing, feeling and reality. The dots and brush work allow us to experience the ancient stories. Ferguson paints about story, relationship and deep knowing in the colours of Australia and in a manner that invites the viewer to journey to places deep inside. 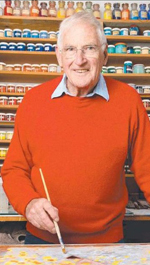 His commitment to his art has seen Bill Ferguson develop a deserved reputation as a prominent Australian painter with work represented in many major collections, including the Australian National Gallery.